Unless you’re in a cave asleep, you’ve seen the recent Oracle PSUs and patches that were released in January. This has many of my customers patching their agents, and a few have noticed a problem with some previously applied patches. Thanks to Brian for pointing this out! 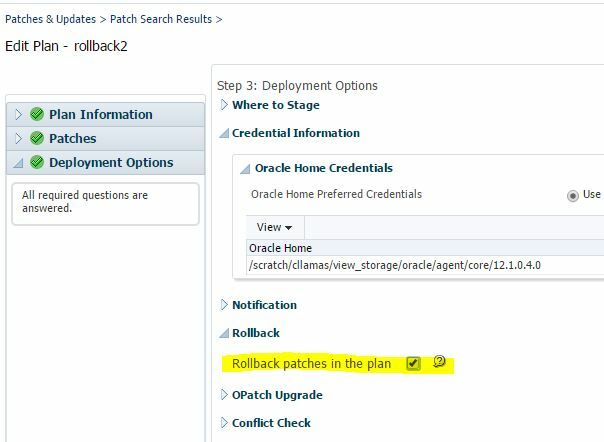 To remedy this with EM, you can create a patch plan with the Java patches (18502187, 18721761) and select Rollback in the Deployment Options. This will run the rollback for these patches. Once rolled back, re-analyze your 12.1.0.4.5 patch plan and it should be successful and allow you to deploy! Be sure to update any Agent clones/gold images with the newly updated patch and plug-ins if they’ve been upgraded or patched. If you staged patches for auto-deployment in the OMS $ORACLE_HOME/install/oneoffs, remove the old patches and you should just need the 12.1.0.4.5 patch now, or any current Discovery patches. Update your procedural documents to reflect the current patches required. For more details on how to patch your agent using EM, see the Administrator’s guide.